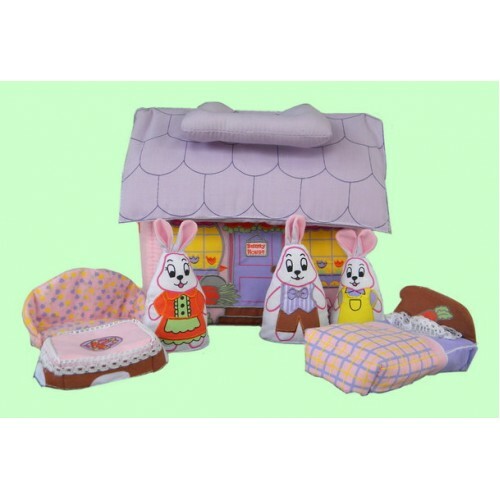 Join this Bunny Family in their soft, quilted house where it's springtime all year round! Zips open on both sides to create a playing surface. Zips closed again for easy carry with handles. Set Includes: Three Bunnies: Papa, Mama, and Baby Bunny. Three charming, lacy furniture pieces: a table, a loveseat, and a bed. Recommended Ages: 12 months & up. Comes in vinyl case to protect all. Add $6.00 for Name on case.